While sharing many classic Mercedes design cues, the new EQC will readily be distinguished by the light bar that crosses the grille and then picks up above the headlights, before making a short J-curve. A closer inspection reveals a variety of steps, such as the air curtains ahead of the front wheels, to minimize aerodynamic drag. That helps boost the EQC’s range and performance. Using a high-speed quick charger, the EQC could get an 80% boost in as little as 40 minutes. 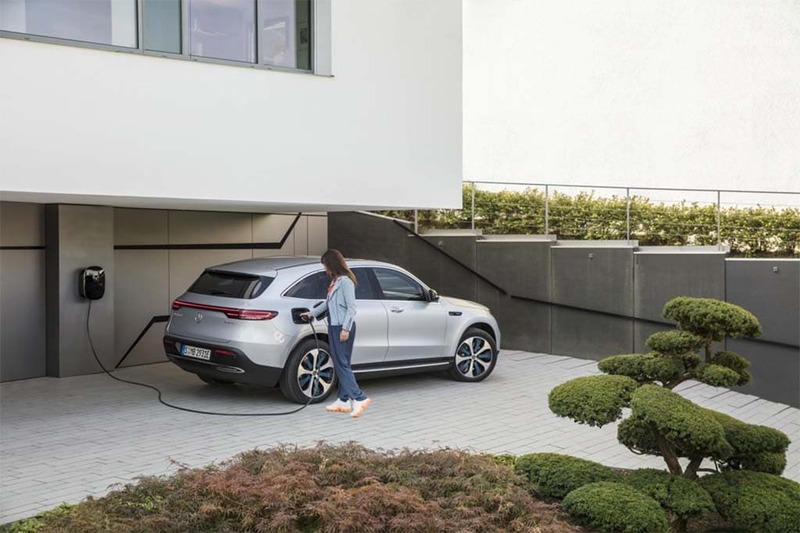 Roughly the same size as the conventionally powered Mercedes-Benz CLC crossover, the EQC adopts the skateboard-like design found in the latest all-electric models, including the Tesla Model 3 and Chevrolet Bolt EV. The approach has a number of advantages, among other things lowering the electric crossover’s center of gravity. It also minimizes intrusion into passenger and cargo space. If anything, it actually frees up space normally taken up by the engine compartment. 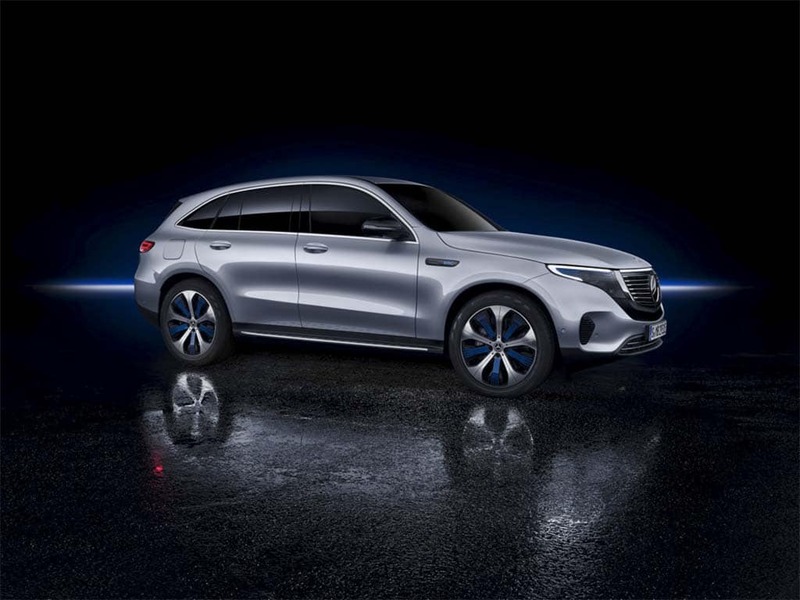 “With its seamless, clear design, the EQC is a pioneer for an avant-garde electric look,” said Gorden Wagener, Mercedes’s chief design officer. The interior is classic Mercedes, with detailing designed to give the EQC a more high-tech look. That includes the widescreen display that connects the reconfigurable driver display with the infotainment system atop the center console. It features the new MBUX, or Mercedes-Benz User Experience, that debuted at the Consumer Electronics Show last January and made its first production experience on the new Mercedes A-Class. MBUX operates more like a smartphone system and adds voice controls that can handle far more familiar commands, much like Amazon’s Alexa voice assistant. It adds a number of features specifically programmed for EV owners, including the ability to quickly find nearby charging stations. 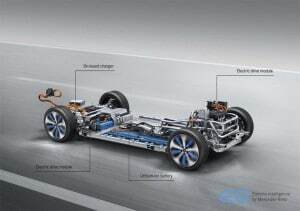 An illustration of the Mercedes-Benz EQC shows its batteries and twin electric motors. 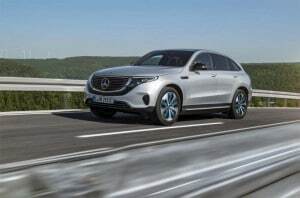 Of course, the key feature of the Mercedes EQC is the drivetrain, which features two electric motors, one on each axle, generating a combined 402 horsepower. The front motor will handle primary driving duties under normal conditions, but under harder driving, “the rear motor adds sportiness,” Mercedes explained. Together, they will be able to move torque around much like the conventional Mercedes 4Matic all-wheel-drive system. Perhaps more importantly, they produce a combined 564 pound-feet of torque that comes on almost instantaneously, rather than having to rev up, as with a gas-powered vehicle. The Mercedes-Benz EQC has an electronically limited top speed of 112 mph and can hit 60 in an estimated 4.9 seconds. 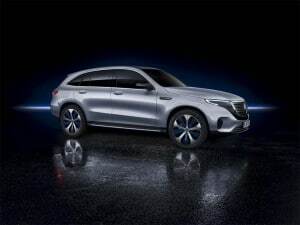 The electric crossover draws power from an 80 kilowatt-hour lithium-ion battery that Mercedes says will deliver “up to 200 miles” range using the EPA test cycle. Charging can be handled in a variety of ways, including the use of an onboard, 7.4 kilowatt charger. For those with access to a second-generation, 110 kilowatt DC quick charging system, meanwhile, the batteries can get an 80% top-off in about 40 minutes, according to Mercedes. The driver can choose how much battery regeneration they want using gearshift-style paddles on the steering wheel. More aggressive regen will allow a motorist to use one-foot driving in many circumstances, effectively the same way a gas-powered vehicle operates when in a low gear. The new EQC becomes the second Mercedes to offer the new MBUX infotainment system. 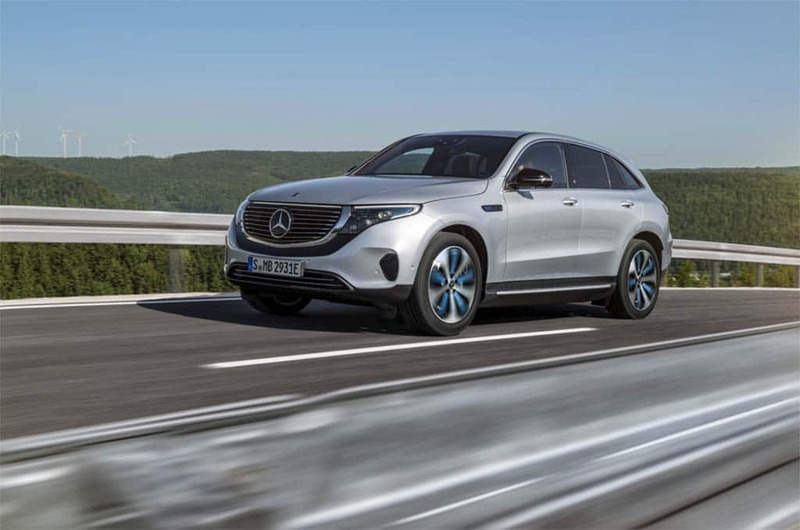 Set to start rolling out later this year from the Mercedes assembly plant in Bremen, Germany, the EQC will go on sale in the U.S. in 2020. Pricing will be announced closer to that date. The question is just how much volume the Mercedes EQC will generate. Sales of all-electric vehicles has been slow, accounting for less than 1% of the overall market in the U.S. and Europe, though demand has taken off in China where it is expected to continue growing fast due to strict new emissions regulations. The slow ramp-up of demand in the U.S. can be misleading, however. Most of the products currently on the market are slow, costly and deliver limited range. Sales are picking up as more affordable models, delivering better performance and longer range, come to market. Tesla logged about 400,000 advance reservations for its Model 3 soon after it debuted in 2016 and has since been struggling to meet demand. The EQC has a top speed of 112 mph and can hit 60 in an estimated 4.9 seconds. But the arrival of the EQC and an assortment of other all-electric models to follow, such as the battery-CUV Audi will debut next month, could pose a serious challenge to Tesla, according to industry analysts. Tesla, meanwhile, plans to fight back with additional products of its own, including the compact Model Y crossover. The big question is whether the market will grow fast enough to absorb all the new entrants, with some forecasting there could be more than 100 pure battery-electric vehicles available by the beginning of the coming decade, along with dozens of plug-ins and conventional hybrids. This entry was posted on Tuesday, September 4th, 2018 at and is filed under Audi, Auto Shows, Automakers, Automobiles, Business, EVs, Electrified Vehicles, Environment, First Look, Frankfurt, GM, Markets, Mercedes, SUVs, Sales, Sales, Technology, Tesla, Trends, Volvo. You can follow any responses to this entry through the RSS 2.0 feed. Both comments and pings are currently closed.